As the legend describes it, Kashmir Valley was a huge lake. Kalhana, the author of the earliest recoded history of Kashmir, Rajtarangni, states that the valley of Kashmir was a huge lake called Satisar. The Lake was drained through the Varmul gorge by Kashyap Reshi after killing the demon Jalodbhava guarding the outlet. The draining of the Lake reclaimed the present valley of Kashmir. The geological findings especially the presence of Karewas (geological formations of sedimentary clay) throughout the valley confirm this mythological belief. For thousands of years Kashmiris had the privilege of having the last remnants of Satisar as Wular, Manasbal, Dal, and Nageen. These water bodies were our living heritage from the times immemorial. In fact, as per the findings at Burzhom and many other similar places, the human civilisation in Kashmir started on the banks of these water bodies right from the Neolithic age. For centuries these water bodies survived and were the pride of Kashmir. Till the middle of the last century that is during the reign of the erstwhile Maharaja Hari Singh, most of the Lakes including the smaller water bodies and even the canals of Srinagar survived and continued to exist. However, with the freedom of the sub-continent and ushering in of the popular peoples’ governments, these water bodies started slowly shrinking and even disappearing. During the autocratic rule people respected the law and there was no escape for violators in any field. Even most of our lush green forests also continued their existence during Maharaja’s reign. Kashmir’s misfortune started after 1953 when the popular leader was removed and general policy of compromise in every sphere of life was liberally introduced. Still people violated the law hesitatingly and there was some accountability. However, after the death of the popular leader and installation of puppets one after the other, there was free for all in every sphere of life. This was the result of uncertainty which has been prevailing since.Because of the political uncertainty the accountability in every sphere of life has virtually vanished. The Wullar Lake has been encroached through growth of willow trees all around and the clear water body has been converted into farming land. 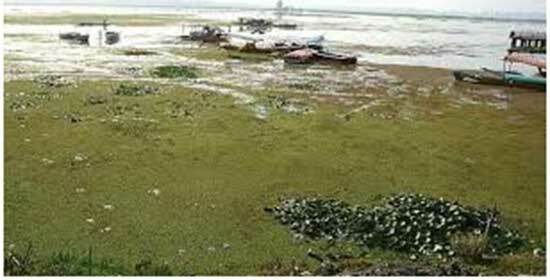 According to some experts it is now an apology of the once second largest sweet water lake of Asia. It is just in last 3 to 4 decades that we, the present inhabitants of the so called “Paradise on Earth”, have (due to our insatiable material greed) brought these to total ruination. Three fourths of blame for ruining these water bodies can be squarely placed on the local people. This is especially true of the Dal Lake. It is immaterial as to who has done how much damage, whether these are house boat owners, hoteliers, vegetable growers, residents inside or on the banks of the lake. Damage beyond redemption has not only been done but is continuing on a daily basis. As regards the role of the people entrusted with the restoration of the Lake, there can be no better judgement than that given by the former Chief Minister Azad who publicly admitted that the Lake has become a “Money Minting Machine” for the politicians! He said so in spite of the fact that the political set up he was blaming was headed by him. The most unfortunate part of the tragedy is that the government had woken up towards the necessity of restoring and conserving the Lake in mid-seventies itself. The best ever report for the restoration and conservation of Dal Lake was prepared in 1977 by a team of New Zealand consultants (Enex Consortium). The consultants had made some very practical recommendations for initiating measures to arrest the further deterioration in the condition of the Lake as also to restore it to its previous glory. These measures would have stopped accumulation of nutrients in the lake and over a period of time this would result in a net loss of nutrients that would in turn curb weed growth and thus improve the water quality. The Enex report provided cost estimates and based on analysis deemed the proposed improvements economically feasible. In fact, at that time the Overseas Development Agency of U.K. and the World Bank had offered to fund the restoration of the Lake through some international agency. Unfortunately, no practical steps were taken to implement the plan. On the contrary, the bureaucrats as usual dithered by discussing endlessly the project report in committee after committee and the politicians in the meantime made hay while the sun was shining on the waters of the Dal Lake! At last the government constituted a toothless non-statutory authority LAWDA, the Lakes and Waterways Development Authority which proved to be an epitome of corruption. It is just like any other government department mostly headed by bureaucrats having absolutely no expertise in environment protection or conservation of water bodies. LAWDA has been moving like a tortoise but not like the tortoise of our school day story of “Slow and Steady Wins the Race”. It is a tortoise which is slow but not steady. In last 30 years or so, the Lake instead of getting restored has gone from bad to worse. If one puts three fourths of blame on the local people, one forth has to be shared by the Government of India also. Even the Comptroller and Auditor General of India in their report have raised objections about the pumping of funds by the Central Government into the Lake Authority without any accountability. The condition to which the Lake had deteriorated could not be reversed by cosmetic slow treatment. It needed accelerated intensive time bound treatment to arrest its deterioration and reverse the same. It may be mentioned that sometime back the Lake Geneva, much bigger than Dal, had suffered worse pollution when even the fish had died. However, with the help of some international resourceful expert agencies they were able to completely redeem it. Why can’t we do the same with the Dal Lake? It may be our last chance and whomsoever takes the initiative will have his name carved in golden letters in the history of Kashmir. There is no time left and we have to wake up from the deep slumber. All the leaders of all hues and colours must come forward and motivate people for restoring and conserving the water bodies. If we fail now, then it is better for us to formally prepare for performing the last rites of the Dal Lake and other water bodies! Overpopulation in the area including those from outside have made the lakes as residential colonies.